Now that the kids are back in school, are you looking for some healthy snack ideas to satisfy their hunger? Store-bought snacks are often highly processed and loaded with sugar. Homemade snacks, on the other hand, can be nutritious and you can present them in fun and interesting ways to make your kids excited to eat them. 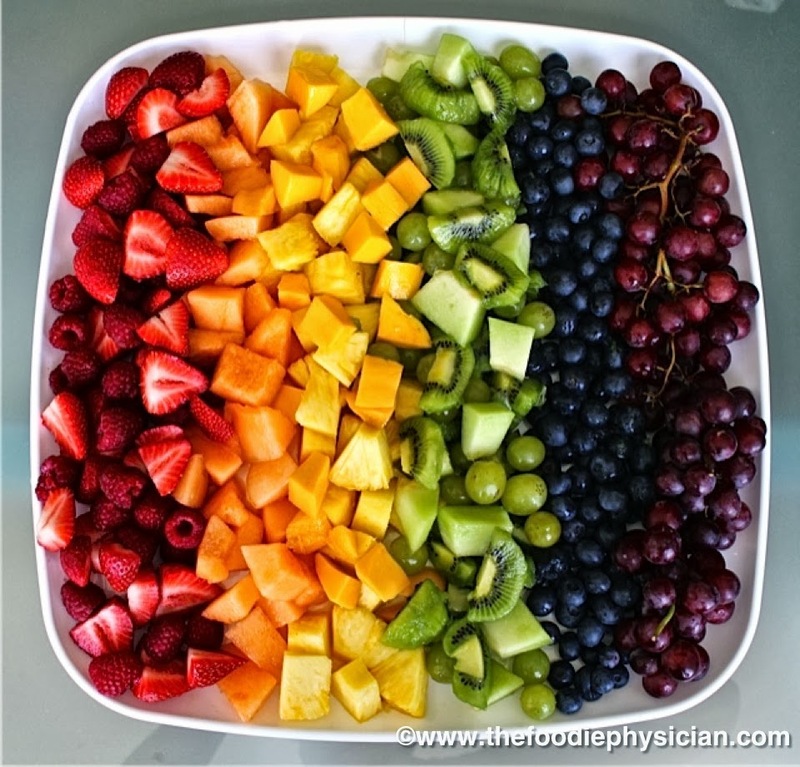 Who wouldn’t want to dive into the beautiful rainbow fruit salad pictured above? Think of snacks as mini meals. They should contain a combination of fruits/vegetables, whole grains, low fat dairy and lean proteins. This way, your kids are getting a good mix of carbohydrates, protein, fiber and some healthy fat. Protein and fiber keep kids feeling fuller longer rather than typical sugary snacks, which give a short burst of energy. Here are some of my go-to healthy snack ideas for kids that you can pack in their lunchbox or make for them after school. They’re all nutritious, easy to prepare and satisfying. (1) Pita pizzas: A lot of kids enjoy participating in the kitchen and they’ll often be more likely to eat a food if they’re involved in making it. Try using familiar foods like pizza, pasta or meatballs as a canvass to introduce your children to new, nutritious ingredients. Make quick and easy pizzas by spreading tomato sauce on whole wheat pitas. Top with some shredded mozzarella cheese and then let your kids add their own toppings. Present a variety of colorful vegetables like spinach, corn, bell peppers, mushrooms and zucchini to make them more enticing. You can also use diced chicken breast or shrimp. Drizzle with a little olive oil and bake in the toaster oven until the cheese is melted and the veggies are cooked. (2) Fruit/Vegetable and cheese kabobs: Kids love eating food on sticks like corn dogs and candy apples. So make a healthier version by skewering up nutritious fruits, vegetables and cheese. Traditional skewers are safe for teens but for younger kids you can use popsicle sticks, chopsticks, or coffee stirrers. To make things more fun, use cookie cutters to cut the food into interesting shapes like hearts and stars. Try combining strawberries, melon, and grapes with reduced fat cheddar cheese. For an Italian inspired kabob, use a combination of cherry tomatoes and reduced fat mozzarella. Drizzle with some store bought pesto for extra flavor. (3) Whole grain toast or English muffin with peanut butter or almond butter and sliced strawberries: This quick snack will satisfy a serious sweet tooth but still provides a good mix of whole grains, protein, fiber, carbohydrates and healthy fat. (4) Smoothies: Smoothies are a great snack because you can play with different flavor combinations and customize them to what your kids like. Plus, what kid doesn’t like smoothies? My favorite smoothie combines mixed berries, bananas, grapes, nonfat Greek yogurt and honey. You can throw in some flaxseed for extra fiber and omega-3 fatty acids. You can even freeze the leftovers to make popsicles. (5) Turkey pinwheels: Kids love food that comes in interesting shapes so try these pinwheels instead of the usual turkey sandwich. Spread a whole wheat tortilla with hummus or reduced fat cream cheese and top with a few slices of turkey breast. Then pile on colorful veggies like carrots, red or yellow bell pepper slices and spinach. Roll the tortilla up burrito style, secure with toothpicks and cut into slices. Make a couple of these and you can feed a crowd. 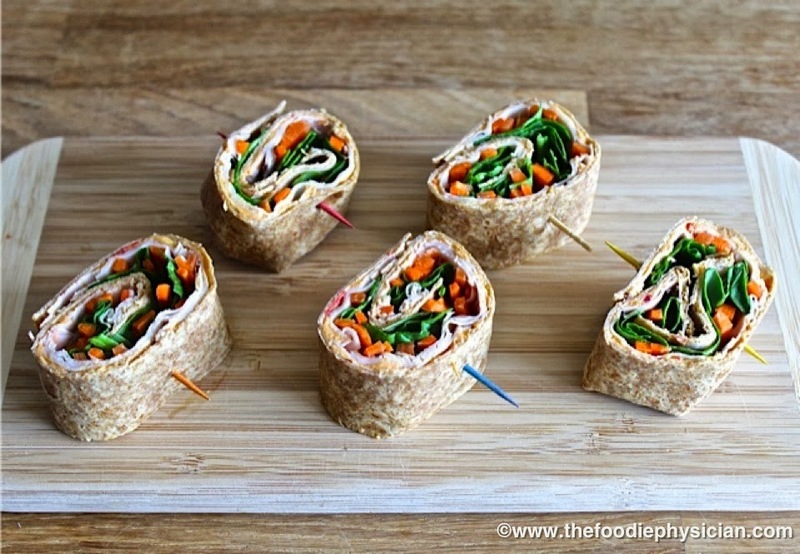 These pinwheels have a great mix of whole grains, lean protein, dairy and nutrient packed veggies. See recipe below. Lay the tortilla out on a cutting board. Spread the hummus over the surface of the tortilla. Arrange the turkey slices on top of the hummus and sprinkle the spinach and carrot sticks on top. Fold in the sides of the tortilla and roll it up like a burrito. Use toothpicks to secure the filling in place and slice into 5 pieces. Remove toothpicks before serving. Assorted sliced or chopped vegetables or meat like bell peppers, mushrooms, corn, zucchini, spinach, chicken, etc. Place the pitas on a baking sheet lined with parchment paper. Spread ¼ cup of tomato sauce on each pita, leaving border around the edges. Sprinkle ¼ cheese evenly on each pita. Add assorted vegetables of your liking to each pita. You can also use chopped chicken breast or cooked shrimp. Spray the pizzas lightly with olive oil spray and season with salt and pepper. Bake in the oven until pitas are crispy, cheese is melted and vegetables are cooked, 8-10 minutes. Remove from oven, cut and serve. Pizzas can also be cooked in a toaster oven. Sushi style! kids would love mainly because of the look. You have provided the useful and helpful information. I like the way you written the post on healthy foods. You have raised such great points to think about. Thanks for sharing. Oh yeah!! All the pictures are said that healthy snacks are really good for health. If it is homemade food, then there is no problem to eat. It is fully secured for your health. Thanks!! There seems nothing better and healthier than homemade nutritious snacks. Thanks for the post.